One of the greatest things about conference calling is that it made real life participation obsolete. However, this created new problems: old phone systems require a separate line to conduct perfect conference calls, while free solutions are not fully reliable, they’re not always available for others and the free version is typically far too limited. 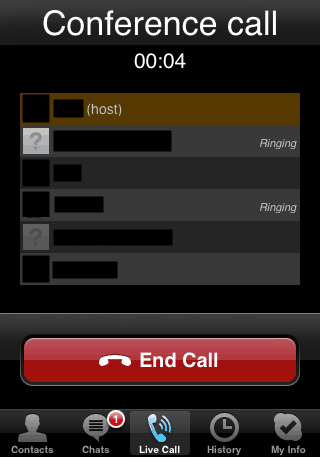 This is when the built-in conferencing features of professional cloud phone systems come in handy. This guide tells you how conferencing via VoIP usually works if you conduct conferences with tens or hundreds of people, or just want a third party to join an ongoing conversation. You can also read about the options you have regarding the devices with which you can participate in conferences. Conferencing through VoIP is traditional and innovative at the same time: traditional because if you have done conferencing before you have nothing new to learn; and innovative, because it still adds new features to the mix, such as unlimited minutes/calls. Furthermore, you don’t have to put other calls aside: you can easily connect two calls (with the aid of the call hold feature) using your phone or the phone system account. If you are planning a bigger audio(visual) conference call, you only need a separate extension to which anybody can join provided that the caller knows the number. Speaking of that specific number, you can invite participants by email/business text message (sent using your system) where they can learn about the details of the conference. You can also join a conversation using your softphone or a mobile device, but if you don’t feel like talking, you can use the VoIP service provider’s instant messaging option, replacing Skype or Facebook Messenger with an enterprise-grade solution. And we haven’t even mentioned that you can send and share files with others (using a built-in feature or an integrated app) as many times as possible. Like we mentioned above, conference calling is easy as pie provided participants have some way (a dial-in number or URL) to fully join or just listen to a conversation. The same easiness applies to devices which participants can use; however, to use the system in its full potential, especially the free of charge nature of VoIP conference calls, all devices must be connected to the internet directly or by using an adapter. Should you satisfy these conditions, you have virtually endless choices regarding the type of device you wish to use. You can use the traditional approach and conduct your calls via speakers (conference phones) with enhanced microphone feature and interference resistance so you and the others around you can be heard crystal clear all the time. It is more likely you and others will use your smartphones or sit at desks, using your own desk phones or computers (should you have a softphone installed): in this case you start the conversation by initiating a call from the specific extensions we mentioned before. 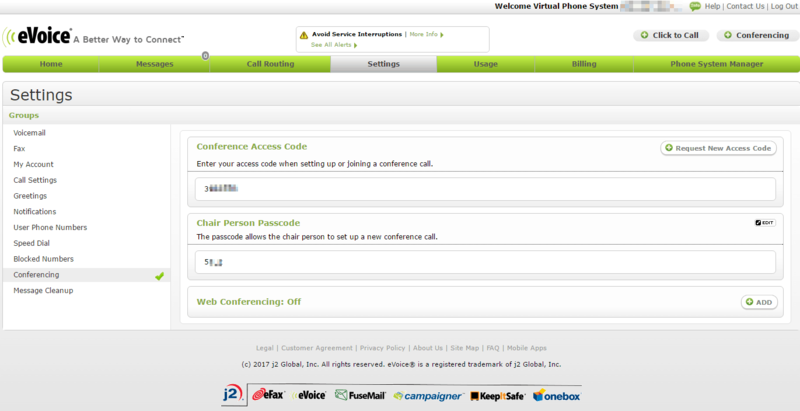 Furthermore, most desktop devices have specific keys with which you can connect/disconnect participants, a feature also present if you use conferencing from your computer or from the phone system’s app. 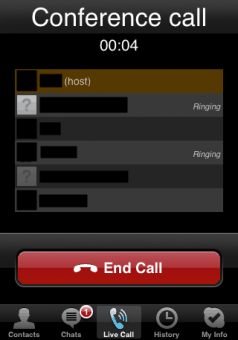 Even though VoIP conferencing is essential, many cloud phone system providers charge extra for this feature. 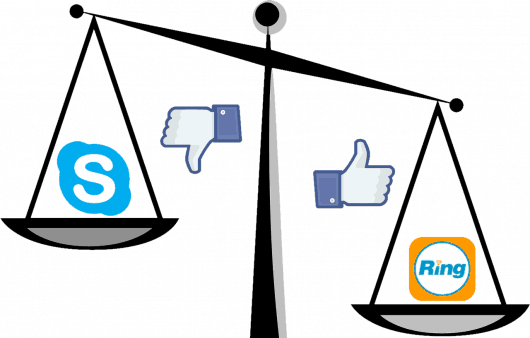 This could not only alienate you from the VoIP company, but it also forces you to use free solutions, like Skype, Google Hangouts and Facebook Messenger, which are even further from perfect. The biggest problem with these services is that they are mostly intended for being used on computers and on a relatively smaller scale, while professional phone systems can handle up to thousands of participants at the same time, providing the same quality from phones, mobile devices or computer platforms. This leads to another problem: you are forced to install additional software to organize and join conference calls if you want to conduct free of charge conferences. This means that you have to pay extra fees (by the minute or a predetermined amount per month) to include calls to and from regular devices. And once you get over this issue, there is still the problem of lag (due to different signal qualities), you have limited control over the conference (everything but getting invited is up to the invitee only), while group messaging/file sharing can be seen by every participant and not just designated people. And, of course, free conferencing apps are spammed with unwanted ads popping all over the place. Almost all companies offer some sort of conferencing in their subscriptions, but we think that the following three, namely Grasshopper, eVoice and RingCentral, are the most prodigious. Grasshopper doesn’t have true conferencing included in its standard service; you have to use OpenVoice, the other product of Grasshopper’s owner, Citrix. However, OpenVoice has some features not present in Grasshopper, like toll-free numbers for 50 countries, integration with Microsoft Outlook (scheduling), separate mobile apps for portability, call recording and the inclusion of up to 2,000 participants at once. 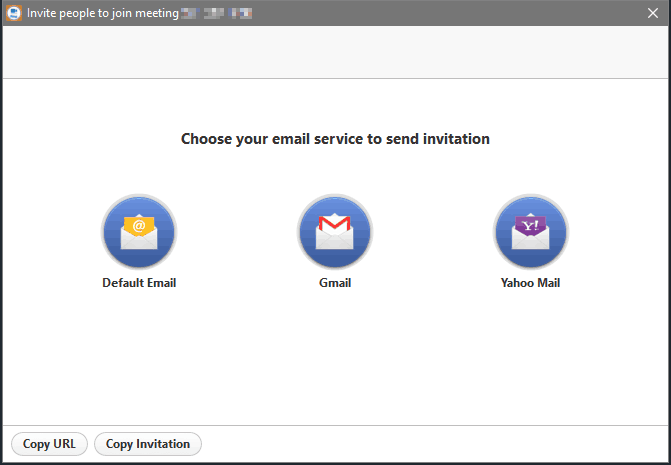 Furthermore, you can optionally integrate your OpenVoice account with other GoTo products (also owned by Citrix), and include a Call Me button for GoToMeeting attendees. Grasshopper’s third-party solution is only $0.08 per minute per attendee but for 3 months you get 25% off and the option to try GoToMeeting for free for 7 days. With eVoice’s conferencing feature, which is included in all plans, you can conduct conferences with up to 94 participants without bothering usual other inbound/outgoing phone calls (thanks to the free second line). Hosts have complete control over conferences: they can schedule meetings, manage features like file sharing and they are provided with a dedicated phone extension kept just for conferencing purposes. Other participants can simply call that extension once they are invited via email or a text message or they can click on the link in the same message if they wish to contribute to the conversation via softphone. Attention: web and video conferencing are not included as they cost an extra $19.95 per month. 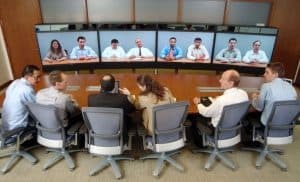 RingCentral is known for providing quality, enterprise-grade features, including unlimited conferencing. Aside from Glip, which is perfect for instant messaging, you can download RingCentral Messaging to all major platforms (mobile included). This app can easily handle HD video conferencing for up to 50 people (1,000 if the call is audio-only) and integrate Microsoft Outlook (or download a plug-in therefor) to be able to continue emailing while conducting the conference. You can also share your screen and files with others and allow participants from 40 countries to join the conversation free of charge. Furthermore, thanks to the unique spotlight feature, attention is always directed to the current speaker.